The body of a man which was recovered from a Bedfordshire beauty spot had been decapitated, police have said. 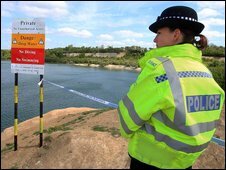 Officers were called to the Blue Lagoon in Arlesey on Sunday after two passers-by found the body. The death is being treated as murder and police revealed the body of the white man was found wrapped in layers of packaging. A wheelbarrow, found with the body in the lake, has also been recovered and is being forensically examined. Det Ch Insp Jon Humphries said: "Our suspicion is that the wheelbarrow was used to convey the body to the lake. "We don't know exactly how long the body has been in there but if anyone has seen someone acting suspiciously in the area, or has information that may help identify the victim or his killers, then please contact the police." A search of the area surrounding the lake is taking place. Investigators are also preparing to search the entrance and exit routes to the Blue Lagoon. 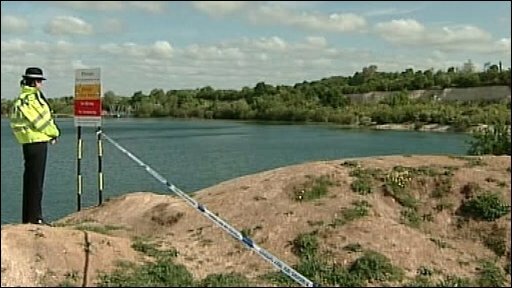 The site, a deep, former quarry pit which has been turned into a lake, has seen six deaths in eight years. In the summer of 2007, a 16-year-old boy drowned there. An 18-year-old man died at the lagoon in June 2005 after he jumped into the water from a boat. And in July 2001, three children drowned when they were trapped in the back of a car which plunged into the water.